Campaigners are celebrating after plans to merge two primary schools were rejected by an independent adjudicator. Under Rutland County Council proposals, Leighfield Primary and Uppingham Primary would have been replaced with a single school on a new site. But an adjudicator turned the plans down - citing the level of local opposition and concerns over funding. 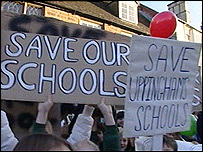 Protester Polly Rubenstein said the decision to retain the two schools was "wonderful news". Office of the Schools Adjudicator Elizabeth Passmore said a new school would have been the right outcome on educational grounds, but decided the opposition and doubt over adequate financial resources was crucial. Mrs Rubenstein said: "We are absolutely delighted - it is a victory for common sense so we are over the moon about this." She said it was a "rare example of people power". Thousands of people signed a petition opposing the merger which said the two schools were successful and should be left alone. But education officials had said the area needed a single school with better facilities rather than two under-subscribed schools.